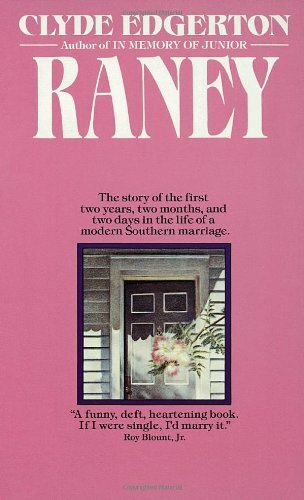 RANEY, adapted by John Justice: (90 minutes): Families marry families. And how! Raney Bell is certain she knows how the world is and how it should work. Her family taught her. Then Raney marries Charles Shepherd, whose view of things is equally confident... and radically different. Because he learned from his family. The play is a comedy of manners and colliding world views, much of the fun and heartbreak coming from the triangle of Raney, Charles, and Raney’s odd, funny and troubled Uncle Nate. Reconciliation in the end, with a world of family misunderstandings--hilarious, hurtful and, at bottom, loving--in between. Cast of five men and three women.... Works best with a Raney and Charles who can sing well together.... works very well with a warm-up band to energize the house and set the tone for the show... Can be done with basic technical resources... need a coffin for Nate’s body in Act Two.... Play sticks pretty close to the book’s core. About the playwright: A Chapel Hill playwright, John is author of the produced plays “Savages,” “How Wisteria Bought the Farm,” “Two Sams,“ and “Sam/Sara.” His adaptations of “Raney,” and “Walking Across Egypt” have been produced many times in the South. He is a past winner of the North Carolina Arts Council Playwright’s Fellowship and a member of the Dramatists Guild. WALKING ACROSS EGYPT, adapted by Catherine Bush (90 minutes). What’s a good, strong woman like Mattie Rigsbee to do? Widowed, slowing down, and with a grown son and daughter who love her, but refuse to give her grandchildren? Opportunity knocks--or in this case, breaks into Mattie’s house--when teenager Wesley Benfield runs away from his reformatory, barges into Mattie’s life with his cigarette breath, foul language, and pleas to be adopted. Mattie sees Wesley as a prime example “the least of these” and worthy of help. But he’s also a piece of work and she takes her time deciding. Mattie’s unusual relationship with Wesley shakes up her family, church and community. Her decision brings it all home in a tender, funny and satisfying way.